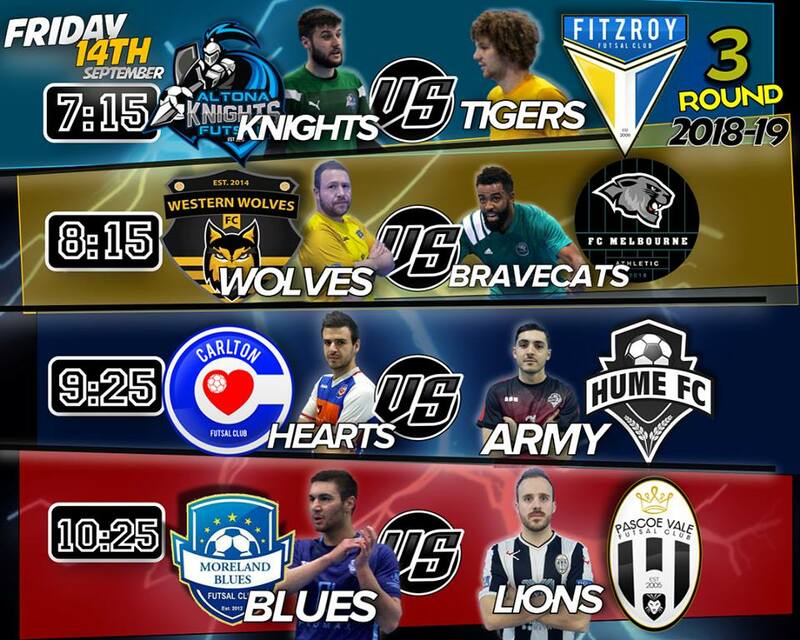 The first game after the SFA break saw newly promoted Altona Knights face Fitzroy. As expected Fitzroy were bossing possession but conceded first as some good target play from Habib Fleiful saw him turn and rifle home a shot to open the scoring. Fitzroy hit back as some good work from Fernando de Moraes saw his effort deflect home off Ben Monteleone to restore parody. Altona again took the lead as Nikola Jurcic took the ball down the line and unleashed a rocket into the top corner to give the Knights the lead again. A late ten meter penalty was awarded to the Tigers which Jose Filho converted to ensure the sides were level at the break. Fitzroy came out of the half time break the stronger and took the lead for the first time as a well worked free kick saw Filho put home his second, but some sloppy marking shortly after allowed Kojo Brown to find the net from range to again level the scores, this time at three. It then took three attempts at goal for Fitzroy to find the lead again with Scott Rogan eventually putting the ball in the net, before Leo Kimpara finished his one on one chance low into the bottom corner to give the Tigers some breathing space. Rogan then sealed the game as he found himself free on the edge of the area. Altona turned to the fifth man, but it back-fired as Aaron Yu hit an empty net with a drop kick for a 7-3 lead. Another thumping effort from Jurcic saw him clean out a few cobwebs but it would only be a late consolation as Fitzroy get back on the winners list. Next up saw Western Wolves who were without a point yet in the new season face Melbourne Athletic who were coming off a solid victory over Hume a fortnight ago. The Wolves were heavily undermanned but managed to strike first as Sofiane Soufi split the wall from a free kick. It was soon two as a long throw from Soufi was nodded down by Nathan Long for Melvin Becket to strike and have the Wolves leading 2-0 at the half time break. Early in the second half Melbourne got themselves on the board as a swift counter attack saw Ben Grillo tap home to halve the deficit, and shortly after the Bravecats were level as Simone Pelletti split the wall to continue his goal scoring form and have his side on par. The Wolves were ahead once again as Sofiane Soufi converted his second free kick of the game striking the ball over the shoulder of George Paschalidis, before a counter attack saw Soufi lift the ball high into the net to complete his hat trick. It seemed a night for poor walls as Soufi again picked a gap to slot home his third from a free kick and his fourth of the night for a 5-2 lead which looked to seal the points. 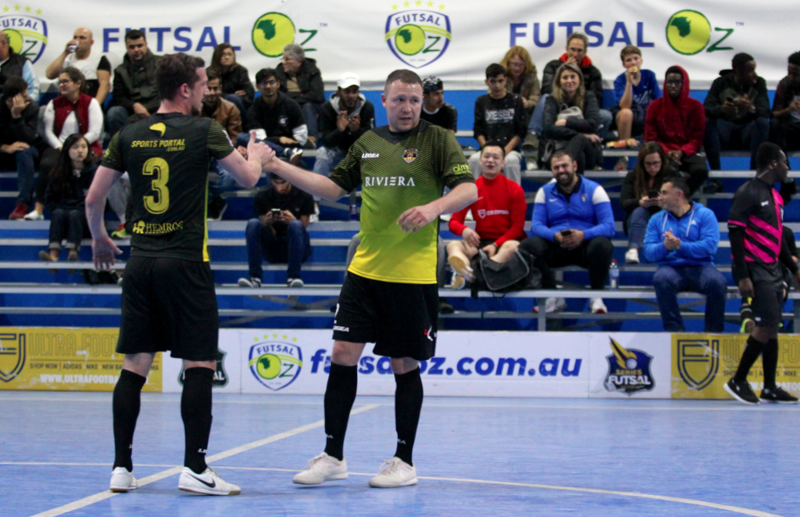 Some fancy footwork from Pelletti saw him round a player and the keeper to slot home his second of the game to keep Melbourne in it, but they would fall just short as a ten meter penalty was awarded which Vincenzo Musico converted to seal the Wolves first three points of the season. 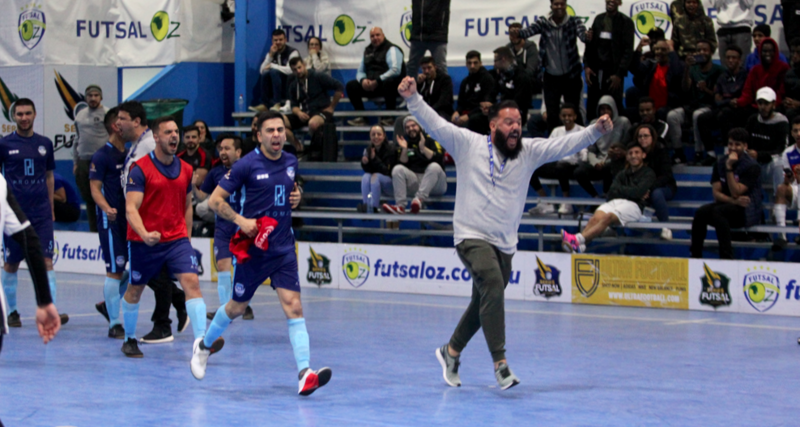 Next up saw Carlton Heart coming off a Series Futsal Australia title win over the weekend take on a Hume side who have yet to register a point in the new season. 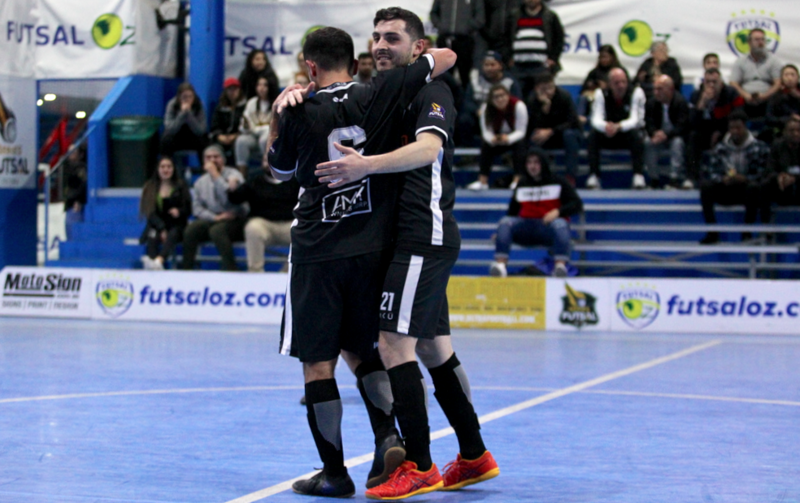 An early injury to Carlton star Arturo Garzon Diaz left Cartlon down a man early, but they managed to shake off the disappointment of losing their star to open the scoring thanks to a long range effort from new inclusion Josh Pulvirenti. Moreland were level as Nejdett Sahin marked his return from suspension with a goal to have the scores locked at 1-1 at half time. Early in the second half Sahin would find the net again to give his side the lead, but Carlton continued to fight and pulled a goal back through young goal scoring machine Sinan Gluhak to level the scores at two. A lay off from a side ball was lashed home by Hannah Shamon as he restored the Hume advantage, before Sahin completed his hat trick as he slotted a worm burner under Peter Tamburrino for a 4-2 lead. Ernie Simsek found the net from a corner to set up a grand stand finish, but it wasn’t to be as Hume held on for their first points of the season handing the Champions their first loss of the season. 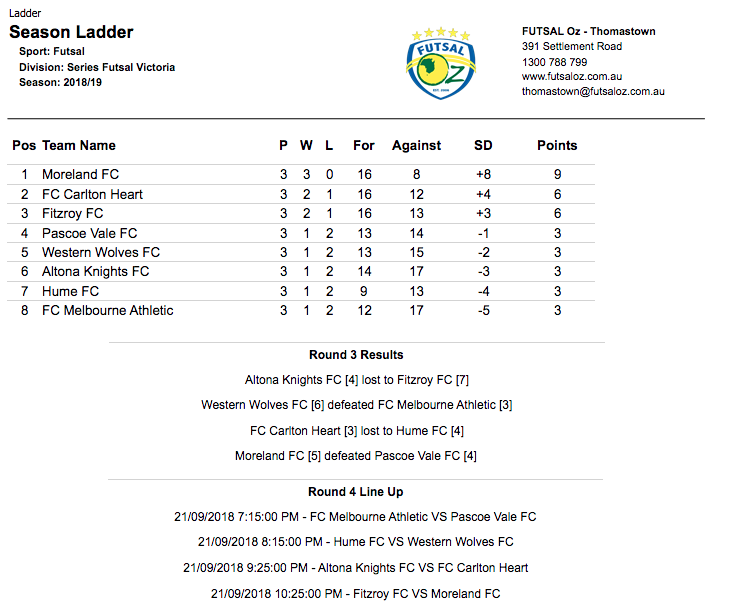 Our final game of the evening was a mouthwatering one as Moreland the only undefeated side left in the competition took on Pascoe Vale who would be looking to go level on points with their rivals. It would be Moreland who opened the scoring through new signing Atay Ibrahim who continues to deliver for his new club. Pascoe Vale were then awarded a penalty, which Lucas Vaz stepped up and converted to level the scores at one. Moreland would regain the lead as an Adam Cooper shot found its way to the back post where Ruz Roslan was waiting to tap it in. A free kick on the edge of the area saw Cooper put it into the top corner to give Moreland a 3-1 half time lead. Early in the second half Pascoe Vale pulled a goal back thanks to some lovely individual play from Andre Caro as he beat his man and picked it into the top corner. 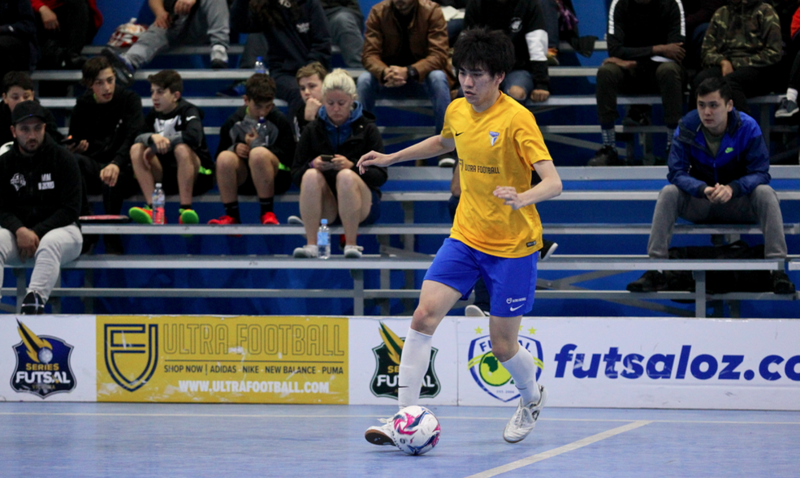 The Lions then drew level as Henrique Fernandes Pimenta threw in a few step overs and cut onto his left foot before finding the bottom corner to level the scores. Cooper would stand tall again as he picked out the bottom corner from range to restore the Moreland advantage as they looked to hang on. With time running out Moreland were looking to run down time, but with under a minute to play Andre Caro ghosted in from a corner and turned before lashing home to level the game and send it to penalties. Only Atay Ibrahim would convert his penalty as Moreland took the points to remain the only undefeated side in the competition after three rounds.